Small Chick Sara and I are brewing up for the NYC Craft Beer Festival! It is on Saturday, March 30th at 68 Lexington Ave in the big apple. Not only does this exciting event bring out your inner Sir, but gives you access to awesome seminars such as Do You Know Your Craft led by Giancarlo Annese and Sarah Annese from their fantastic site Beer Union. A picture says a thousand words, and since there are so many wonderful things to tell you about this festival, I think you should come and see for yourself! LOOK AT ALL THE CRAFT BEER TABLES. That, my friends – is a paradise fit for a Sir. 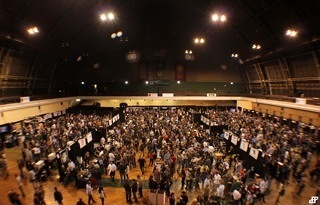 This entry was posted in Beers, Beers & Booze, New York, New York City, nyc, SCBD, SCBDExclusive, Small Chick Big Deals, Stephanie Rose, yummy and tagged angry orchard, craft beer, nyc craft beer fest, scbd, small chick big deals, springs seasonals, stephanie rose by Stephaniirosee. Bookmark the permalink.